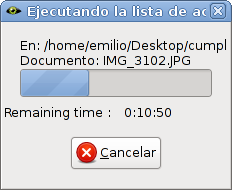 the name of the files being processed, or even the window title. Good to see you using Phatch. Unfortunately the progress dialog is a predefined wx dialog and I don't find a way to make it resizable. I'll ask on the wxpython mailing list to know for sure. I 'fixed' it in Phatch by forcing Phatch progress dialog box not to start with an empty string. It is available from bazaar. """+1 is added because eg opening a file is also an action"""
$ bzr commit -m "fix small progress dialog box"
However my patch solves the usability issue.